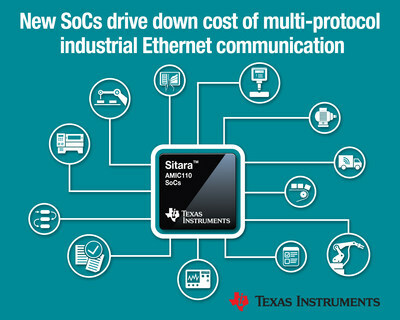 DALLAS, June 6, 2017 /PRNewswire/ -- Cost-optimized industrial Ethernet communication is now attainable with the newly announced family of Sitara™ AMIC SoCs from Texas Instruments (TI) (NASDAQ: TXN). The AMIC110 SoC is a multiprotocol industrial communication processor that provides a ready-to-use solution supporting more than 10 industrial Ethernet and fieldbus communication standards. The device leverages TI’s unified software platform, Processor SDK, and the programmability of TI’s industrial communications subsystem (PRU-ICSS) for industrial communication support in factory automation and control applications. For more information, see www.ti.com/amic110-pr. Built on the industry-proven Sitara processor platform that features flexible peripherals, industrial temperature ranges and unified software support, the AMIC110 SoC was developed for industrial designers. The Sitara AMIC110 SoC can serve as a companion communication device to a microcontroller (MCU) such as TI’s C2000™ MCU, for connected drive applications. By harnessing the strengths of C2000 MCU LaunchPad™ development kit and the AMIC110 industrial communication engine (ICE) development board, developers can create a highly integrated and scalable Industry 4.0-ready solution. Jump-start your design with the AMIC110 SoC by downloading the EtherCAT Slave and Multiprotocol Industrial Ethernet Reference Design. In addition to the AMIC110, this reference design also showcases the DP83822 PHY device that is well suited for Industrial Ethernet applications. Read the "Making industrial communication easy with AMIC110 SoC" blog post. Search the TI Designs reference design library for an Ethernet design. C2000, LaunchPad and Sitara are trademarks of Texas Instruments. All other trademarks belong to their respective owners.